Homeowners looking for home insulation that has great thermal performance, works very well as a sound reducer, and is a fire, mold and rodent deterrent, yet impacts the environment minimally, should definitely consider denim insulation, says Mass Energy Lab, a local Boston based home insulation company. "There's been a massive increase so far this year, compared to the last year and it can be attributed to an increased trend we are seeing of homeowners wanting to have more non-toxic insulation or 'greener insulation' put into their homes and are willing to pay a slightly premium price for it," said Edward Liu, Finance Manager. "Ultratouch denim is becoming an extremely popular choice with Massachusetts homeowners because they love that it performs well and is still eco friendly and non-toxic, and so we have been stocking up significantly on inventories," he continued. Ultratouch is made from mostly post consumer cotton fibers such as denim jeans, making it a great choice for someone looking for minimal impact on the environment, as it reduces landfill waste, states their website. It contains no chemical irritants and even requires no carcinogenic warning labels compared to other traditional insulation types. Also, it contains no harmful airborne particulates eliminating indoor air quality concerns. 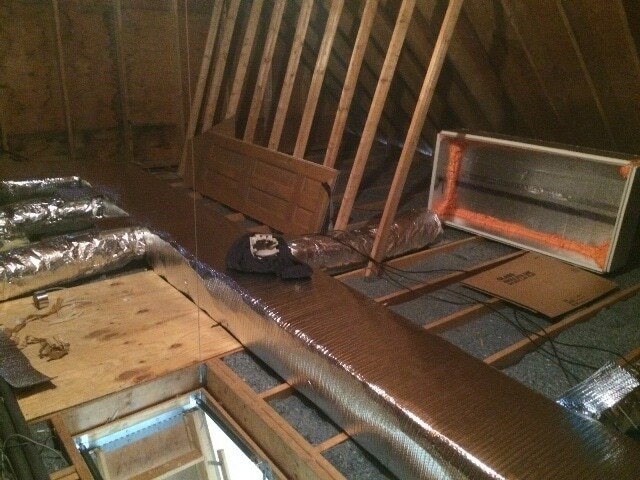 "Most homeowners have us install it in their basement ceilings, attics or garages. Spaces at home where they occasionally spend time and want to have a safer, healthier home for their families," said Josue Valdez, Chief Engineer and Field Projects Manager at Mass Energy Lab Insulation. "A Wellesley woman had us install it in her basement ceiling because the children often use it as a play space, while a client in Hingham had us install it in his garage he's utilized as storage space that he frequently accesses," he pointed out. "They're really impressed with how clean the air is after we're done and like that it has an EPA registered fungal inhibitor that resists the growth of bacteria, mold and fungi. When they realize that it's also treated with a boron based fire retardant, it definitely makes it extremely appealing. The key is to install it with a lot of care and this comes with experience," he added. Mass Energy Lab Insulation is a Boston based insulation company that focuses on designing and installing insulation solutions in Massachusetts homes.